RED BANK, NJ – FC Monmouth avenged a previous loss to Atlantic City FC in their weather-shortened home opener by a score of 1-0 at Count Basie Park on Saturday evening, improving their record in the National Premier Soccer League (NPSL) to 1-2-0. FC Monmouth: Weigel, Judge, Pereira, Gaynor, Martinez; Akampeke, Vicente, Antunes; Covello, Thorsheim, Saling. Atlantic City FC: Perrella, Depalmer, Rose, Hanuscin, Galullo; Dikmak, Macleod, Rivera; Shields, Uiterloo, Vickers. FC Monmouth kicked off their home opener with the opening goal just four minutes into the match. Midfielder and FC Monmouth captain John Antunes scored the club’s first-ever goal with a thunderous right-footed strike from outside of the penalty area. Both Antunes and Woods said that during the week leading up to the match, they spoke about the midfielder’s need to take more risks as an attacker and to try to score more goals. “That goal was all him and his desire to get to goal. I’m happy for him and for the club to get the first goal ever,” Woods said. Per NPSL rules, FC Monmouth was awarded the 1-0 win since the match ended in the second half, despite just over 48 minutes gone on the clock. FC Monmouth’s highly-anticipated home opener was capped off with the club’s first goal and victory. 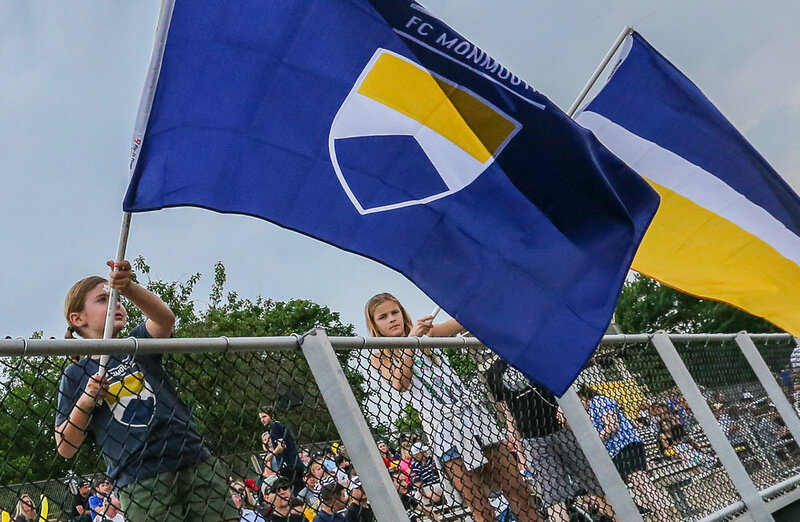 Monmouth will be looking to replicate the result, atmosphere, and 400-500 attendance from their home opener this Saturday when they welcome Hershey FC to Count Basie Park at 6 p.m.
Full recording of the game with play by play commentary by Matt DeLuca and Joey Dicamillo.